I made a rough equivalent sketch of the skeleton, taking care to get the posture and weight as accurate as I could; that much was important to me. 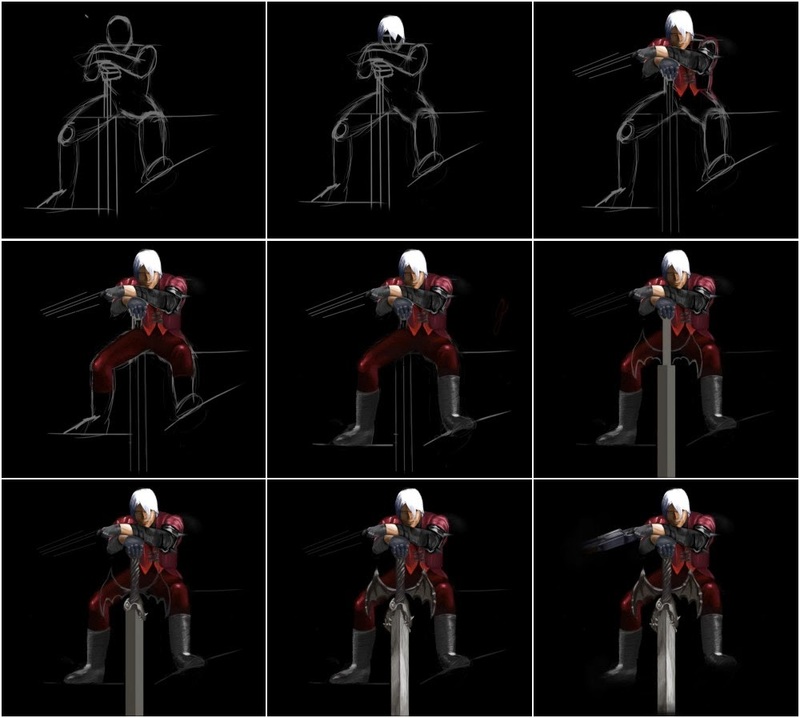 I'd watched a few tutorials on YouTube before I'd decided I would be drawing Dante, and learned a little bit about how to draw the "motion" of a pose. It affected how I shaped the limbs, torso and such initially and led to a much better final image. It was especially important because there are some overlaps this time around, and objects resting on one another. Prior to this, I'd really only ever done characters standing straight up. Once I had the skeleton down (box one on the pic below), I made a point of not doing my normal style of trying to recreate every pixel, line-by-line, with little regard for the architecture underneath. On previous draws, I would actually use the "pin" function of Windows 8 to dock the reference image on the left of my screen, and dock my drawing program on the right. I would match the zoom levels, heights, widths and such to just make it that much more accurate. 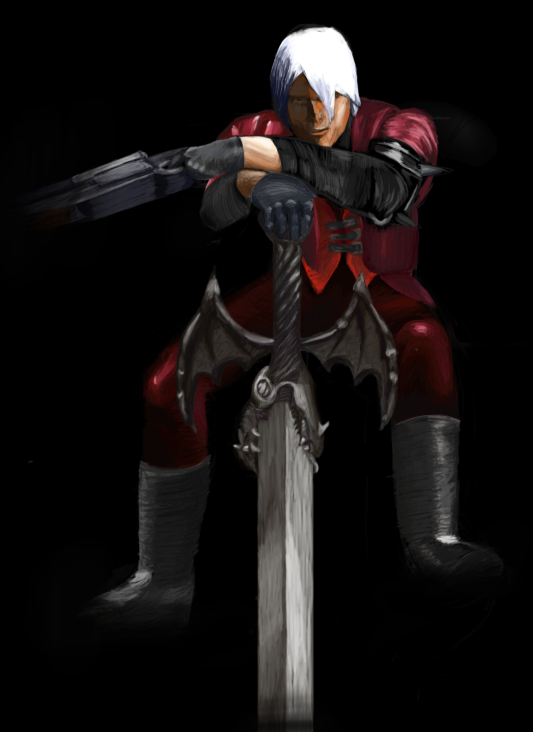 On Dante, I only tried to make a copy of things like the pose, relative position, lighting, and weight. The rest was heavily guided by the original but ultimately left up to myself as far as where and when I wanted to go for a match-up. No longer preoccupied with a per-pixel recreation, I could just enjoy adding things like colors and shadows, and let the motion of my hand do the work. I could adjust details on the fly, as I liked or needed. I took big liberties, as there are way too many variables for me to do it like my older drawings. I think I'm starting to realize that it's better to just do my own work where possible. When I needed to, I improvised and built the details I needed from scratch. I had also made a point of only using the pencil tool in SketchBook Pro. I felt it resembled real, physical drawing more than taking advantage of the layer feature. I felt like it would make a less "cartooney" picture, which was appropriate for the character in relative terms. If you look above, you can see colors were pretty much added from the top-down in a once-over; no base colors were laid, and no shadows or highlights were added-on later. SketchBook Pro has a lot of tools you can use for blending and color transitions, but in this case I hand-picked every last color instead (except on the shotgun; it was drawn last and I was getting tired). It was more tedious than I'm used to, but I think it looks better than it would have otherwise. I'm really pleased with how the whole thing came out. Alastor (the sword) looks better than I'd ever expected, especially considering all of the little ridges, nooks and crannies it has. Thanks to the tutorials I'd watched, I'm also glad to say it seems to have a pretty lifelike posture and weight. 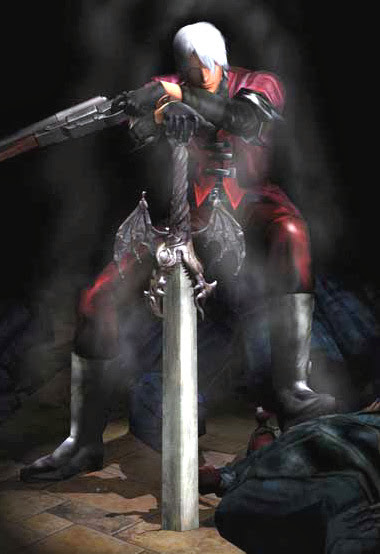 Most noticeably in the vest and his folded arms, it looks (to my own satisfaction at least) like Dante is really leaning forward. Not exciting in and of itself maybe, but for me it's a new personal best. Now criticisms. I wish I hadn't rushed the clasps on the vest; they look really flat, and ... I think only 2 shades of gray were used on them. Shame on me. What makes it worse is that the eye is more or less drawn to that area, as it's the nexus of the pose. I'd noticed that error as I was wrapping the drawing up, but by that point I was tired, and over it. There's also a bit of inconsistency in the smoothness of some areas. You can really see that Alastor (done near-last) is smooth, where Dante's face (done early on) is kind of sketchy. I'm still pretty new to this, so it's entirely possible I "got better" between the start and end. It kind of makes me wish I hadn't done it so compartmentalized. I do feel like I understand light a lot better now, and how it's used to communicate shape. That mostly came from working on areas like the knees. I did the shotgun last, and using what I'd learned, I was able to shape it much more quickly, and accurately. This one was a lot of fun, but damn did it take a long time. It's definitely the most ambitious drawing I've done so far. As before I'm still making some decent progress, and learning stuff which is always encouraging and makes me want to get on with the next one. I'm not sure what I want to do (I'm getting close to making something with no copy at all), but I'm pretty sure I want it be in color pencil.